Leaves fell and those that didn't were knocked off by tornadic storms that hit the Midwest. Fields were plowed and overnight frost killed any vegetation left in the garden. These are all signs that point to hibernation for vintage vehicles. 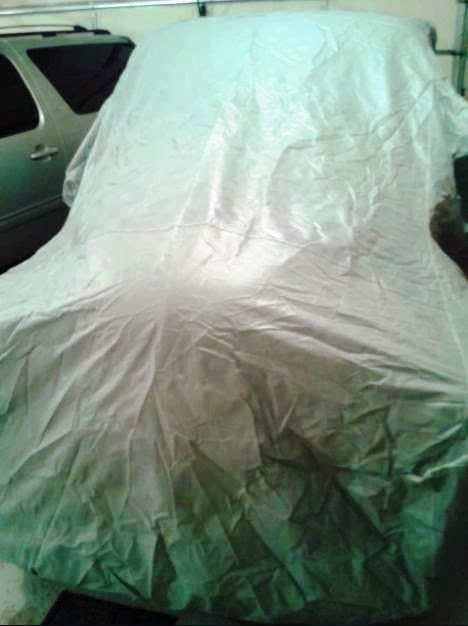 Abbey's brand new (albeit wrinkled) cover was gently placed over her clean robust body and while she rests during the cold months, we plot the changes in her future. Last night's conversation with TD revealed how much he wants to do and how much he wants to farm out. Bottom line discussions were concurrent in that we both want to feel safe when we take old Abbey out on the road for distances longer than 10 minutes away. TD would appreciate not bouncing so hard that he hits his head, and that means a softer ride. A softer ride means more than just a new engine. I've mentioned wanting a straight H-pattern feel with the gear shift instead of a "stirring soup" feel when changing gears. We both would like to rid ourselves of the Widow-Maker wheels. In the spring when things warm up I foresee a garage being used primarily for Abbey and not the other vehicles generally housed there. This could potentially be a large project. In the future I also foresee a heated garage. I used to scoff at heated garages but I totally get them now. Do the automotive projects during winter when yard work and other outside projects cease and you actually have the time to do them - then when spring and warmer weather hits just go out and enjoy the dang vehicle.